The Army unveiled 15 Soldier-vetted technologies here, July 18, all meant to improve command post infrastructure and capability. Those new technologies are now slated for transition to programs of record, representing a culmination of three years of effort by the U.S. Army Communications-Electronics Research, Development, and Engineering Center to improve command post capability. A primary goal for the Army has been to make the setup of command posts less complicated and less time-consuming for Soldiers, and to also make command posts more robust for the commanders who operate inside them, said Tyler Barton, the manager of CERDEC’s Expeditionary Mission Command Science and Technology Objective. The new technologies include, among other things, improvements to expeditionary command post capabilities, the tactical computing environment, and energy-informed operations. Together, these new technologies will make it quicker and easier for Soldiers to both set up and tear down a command post. They will also improve command post connectivity, agility, and scalability. The Command Post Platform-Improved is a prototype single-vehicle solution that was built within a Humvee and designed to support mission command functionality and command post support at the brigade and corps level. The CPP(I) consolidates all essential mission command infrastructure to operate in a single vehicle. When compared to the current technology, the CPP(I) has less height, and provides more capability than two of the Army’s current command post platforms. Today, Army command posts typically consist of a wide variety of tents, each of which must be individually assembled by Soldiers. Those command posts also may consist of a number of vehicles that contain command post functions. All must be cobbled together to meet the needs of the commander. In some cases it may take days for such a command post to be completely assembled. Often, these types of command posts prove too cumbersome and challenging for light forces to set up. 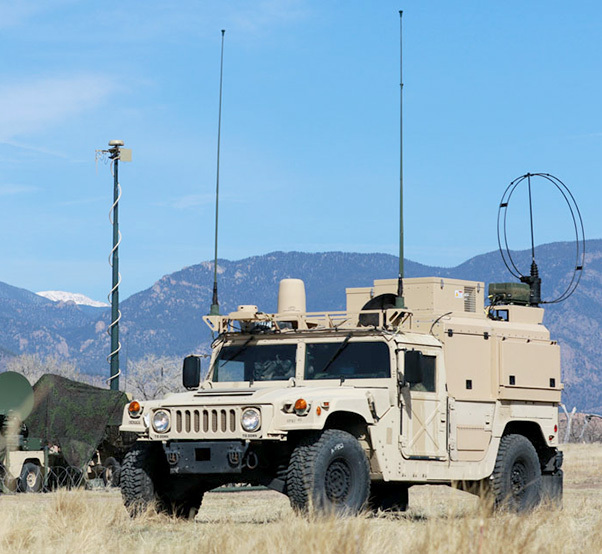 Part of CERDEC’s effort to improve command post infrastructure and capability involves support vehicles designed to support a distributed and reduced command post footprint, all while increasing agility and maneuverability. Two vehicle platforms, the Light-Mobile Command Post, or L-MCP, and the Command Post Platform-Improved, or CPP(I), are part of that effort. The L-MCP provides a self-contained, rapidly mobile command post node that can be used as a small and highly capable mission command vehicle to support light Infantry, Airmobile, and Air Assault forces, said Brad McNeilly-Anta, a command post consultant with EMC STO. The L-MCP is integrated onto a Humvee platform and can achieve voice communication and position location tracking in just 15 minutes. The setup can achieve full operating capability within 30 minutes. The Ultra-Light Command Post Node enables units to establish a unit-tailorable mission command capability rapidly. The vehicle can be dropped from a C-130 or C-17 aircraft, or sling loaded using a UH-60 or CH-47 helicopter. Furthermore, the UL CPN can have an initial operating capability in 15 minutes, followed by full operating capacity in 30 minutes. The L-MCP also includes a retractable table, and a complementary soft-walled shelter can be set up to cover the back end of the vehicle. Once set up, the L-MCP can provide a workspace for a battle staff of six. Moreover, the vehicle can be configured to meet a unit’s needs and features a built-in power distribution system to power all command post resources. 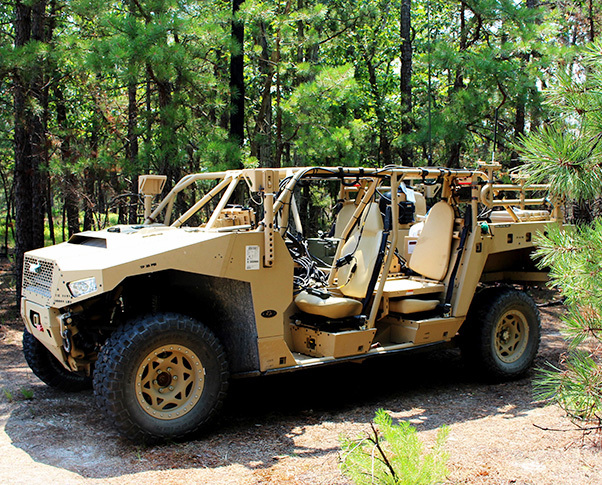 The CCP(I) is a prototype single-vehicle solution that was built within a Humvee and designed to support mission command functionality and command post support at the brigade and corps level, McNeilly-Anta said. The Light-Mobile Command Post node provides a self-contained, rapidly mobile command post node that can be used as a small and highly capable mission command vehicle to support light Infantry, Airmobile, and Air Assault forces. Current command post vehicles are limited, as they can’t mount, power, and cool all the technology required to support a deployed unit, officials said. The CPP(I) consolidates all essential mission command infrastructure to operate in a single vehicle. When compared to the current technology, the CPP(I) has less height, and provides more capability than two of the Army’s current command post platforms, McNeilly-Anta said. Depending on the operation, the CCP(I) takes about 15 minutes to set up or tear down. Servers assigned to the vehicle can be operated in either mounted or dismounted modes and can transition between modes in less than 20 minutes. The CPP(I) also incorporates an onboard vehicle power system that provides ample support to the command information and equipment cooling infrastructure without the need for an external power source. “Everything in the vehicle can be powered and operated for an extended period by just running the engine,” McNeilly-Anta said. 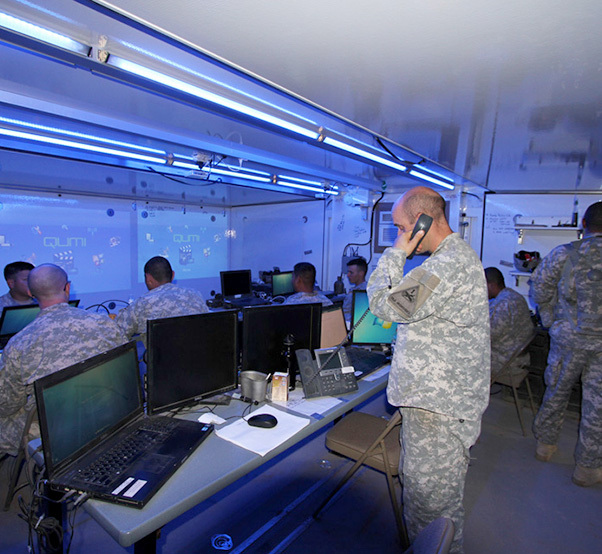 The Expeditionary Command Post is a 20-foot expandable rigid shelter command post node. When compared to a tent-based command post, the ExCP can be fully operational within 30 minutes of emplacement or can be packed and moved in the same amount of time. CERDEC also focused on mission command platforms, to support initial entry operations and provide mobile and tactical command post capabilities. Included in that effort are the Expeditionary Joint Battle Command-Platform, or X JBC-P; the Ultra-Light Command Post Node; the MRZR Command Post Node; and the Combat Action Brigade TAC Command Post. The X JBC-P provides beyond-line-of-sight, secure, two-way transmission capabilities, said Jim Bell, an operations expert within EMC STO. This capability is vital to light and airborne Army forces that typically don’t have access to a portable mission command solutions during initial entry operations. The X JBC-P Kit, Bell said, can be carried by a single Soldier and consists of a rugged tablet, a power source, and transceiver. The unit can maintain power for up to four hours with just two batteries, or up to 24 hours when connected to a portable fuel cell generator. The X JBC-P program has transitioned to PEO Command, Control, Communications-Tactical, or PEO C3T, to help cultivate future dismounted situational awareness solutions. Similar to the X JBC-P is the Ultra-Light Command Post Node, or UL CPN. The UL CPN is a vehicle designed to support Airborne and Air Assault forces, said McNeilly-Anta. The Tactical Computing Environment is an interwoven network of mobile and desktop-based devices, which receive information from several real-time Army data feeds to help create a collaborative experience for commanders and their staff. “We’re looking at initial entry operations … places and missions where units are not going to bring in their large network vehicles and command posts right away,” he said. 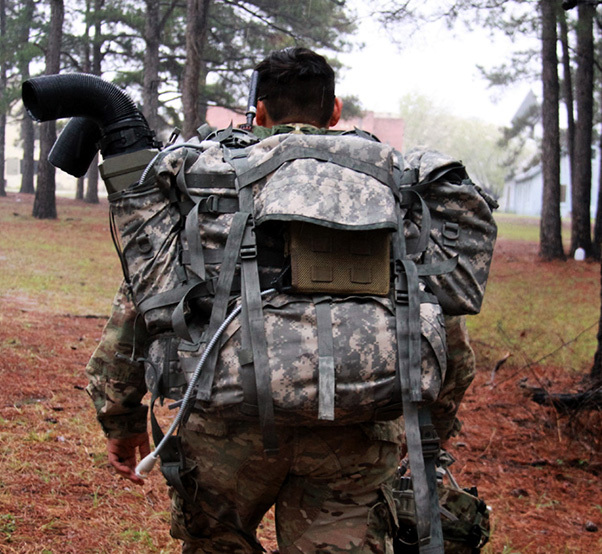 The idea is that Soldiers will jump in carrying their sensitive items, radios, and computers, while other mission essential items are bundled into the back of a UL CPN, McNeilly-Anta said. The UL CPN is designed so that if needed, it can be reconfigured without the need for additional tools. Overall, the UL CPN enables units to establish a tailored mission command capability rapidly. The vehicle can be dropped from a C-130 or C-17 aircraft, or sling loaded using a UH-60 or CH-47 helicopter. Further, the UL CPN can have an initial operating capability in 15 minutes, followed by full operating capacity in 30 minutes, officials said. Similar to the UL CPN, the MRZR Command Post Node is a smaller command post node meant to be forward deployed to enable assault forces during initial entry. The Single Multimodal Android Service for Human Computer Interaction tool incorporates automatic speech recognition software that interacts with the Tactical Computing Environment. 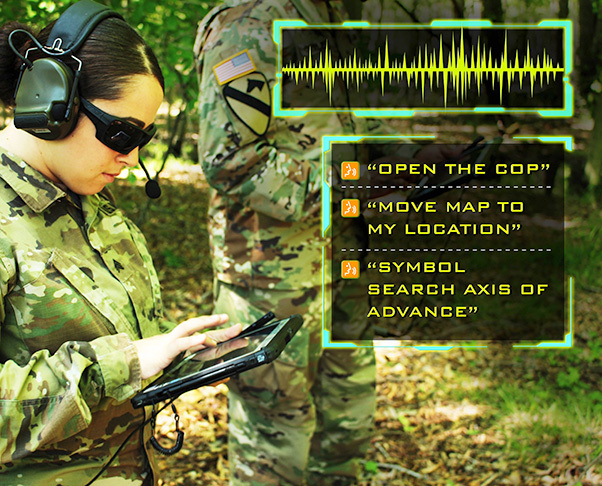 HCI SMASH allows Soldiers to navigate or input information into the system using only their voice. This mobile mission-command enabled device is currently in the first stages of initial early operations, McNeilly-Anta said. Lastly, the Combat Action Brigade TAC Command Post is a mobile mission command node that can be used as a mobile TAC when the central command post is displaced or unreachable. Currently, the program is utilizing an M1068 Standard Integrated Command Post Vehicle as a surrogate for the Armored Multi-Purpose Vehicle, or AMPV, McNeilly-Anta said. This program is currently in development. The Expeditionary Joint Battle Command-Platform provides beyond-line-of-sight, secure, two-way transmission capabilities an operations expert within EMC STO. Equipment packages have also been a focus for CERDEC as a way to improve command post setup and teardown times, and to simplify command post infrastructure. 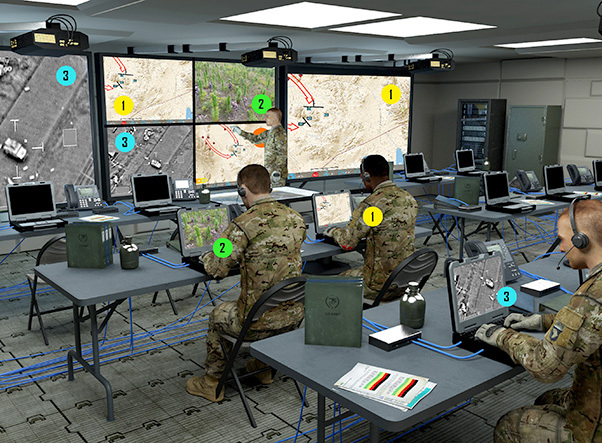 This area of improvement incorporates the Expeditionary Command Post, or ExCP, the Display Action Viewer, the Command Post Display System, and the Unified Voice Management System. The ExCP is a 20-foot expandable rigid shelter command post node, Bell said. When compared to a tent-based command post, the ExCP can be fully operational within 30 minutes of emplacement or can be packed and moved in the same amount of time. The ExCP features fully integrated video distribution, electrical, and network wiring, rapid erect tables with built-in power and network connection boxes, and ceiling-mounted projectors. The ExCP also has built-in air conditioning and lighting, walls coated for use with dry erase markers, and shelves and hooks to place maps or other mission command related materials. The U.S. Army Forces Command plans to field the ExCP at division or core level echelons, Bell said. Additionally, multiple ExCP units can be combined to build larger command post. Several units in the Army are slated to receive the third generation of the ExCP, Bell said. Directly supporting the ExCP and other command post setups is the Digital Viewer Application, or DVA. The DVA provides the Army with a software-based video switching solution and allows command post personnel to connect to the local area network to share all or part of their display with other individuals or on the larger command post display system. Currently, the Army employs an outdated video switching device that requires a large transit case and has a limited number of inputs and outputs. Additionally, the current system can exceed 100 pounds in total weight, Bell said. The new DVA resolves information assurance problems by eliminating an existing video switch that runs an unsupported operating system, Bell said. Further, the application supports the ability to share multiple screens in a grid format on a single viewer display. 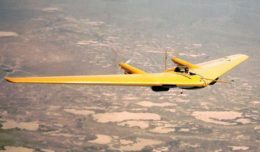 For systems that can’t support the DVA software — like an unmanned aerial vehicle video feed, for example — a separate broadcast appliance can be plugged into the local network, and can share the feed through the DVA software, Bell said. 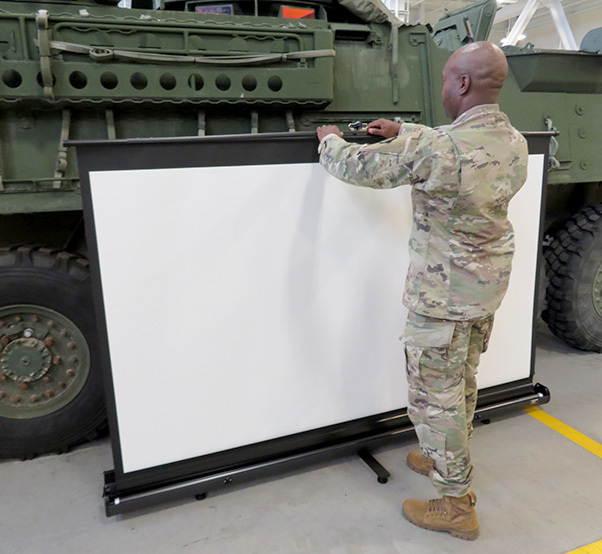 The Command Post Display System is portable,commercial off-the-shelf, large-screen display system meant to replace the Army’s existing portable display systems. The DVA program has transitioned to PEO C3T, where it is being incorporated into the Command Post Integrated Infrastructure, officials said. In addition to the viewer application, EMC STO identified a need for a portable, large-screen display. The Army’s current command post display technology is obsolete, bulky, cumbersome, and expensive, Bell said. The three variations of the CPDS currently being evaluated are smaller and simpler to use, weigh less, and require less space to store or set up, officials said. Projectors are also equipped with long-life LEDs to reduce the need to overstock and replace light bulbs. Soldiers are also field testing short-throw projectors that need to be offset by only 18 inches from the screen to generate a 100-inch image. The 1st Armored Division Artillery is scheduled to experiment with the CPDS this summer, officials added. Both the 11th Armored Division Artillery and the 1st Armored Division will help inform program requirements and capabilities for future display technology. The Unified Voice Management System, or UVMS, rounds out EMC STO’s equipment package portfolio. 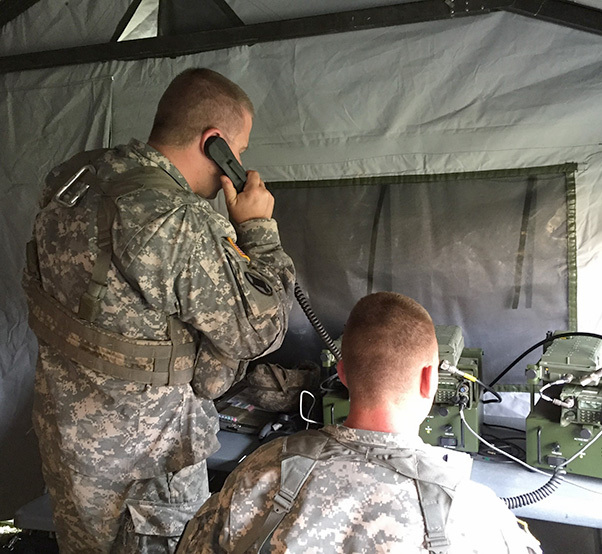 Currently, Soldiers supporting the mission command and command post infrastructure have to operate through a wide range of separate communications technologies. Additionally, these systems cannot cross-communicate unless they are integrated with a channel access unit, or CAU, which adds weight and an additional space requirement to a command post location. The Digital Viewer Application, or DVA, provides the Army with a software-based video switching solution and allows command post personnel to connect to the local area network to share all or part of their display with other individuals or on the larger command post display system. The UVMS is a prototype equipment package that was designed to provide an interoperable solution for radio, digital telephones, and other computer-based or voice software applications. Overall, the UVMS has demonstrated the benefits of a fully interoperable capability that enables seamless voice communications regardless of the devices or applications, officials said. The 173rd Airborne Brigade Combat Team in a forward-deployed coalition environment is currently field testing the new equipment. 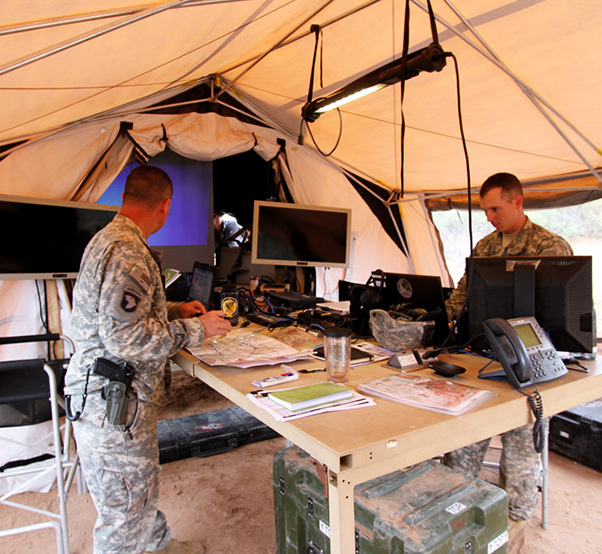 The tactical computing environment, or TCE, was another focus area for CERDEC when working to improve command post capabilities. The TCE enables mission command through a visual representation of a near real-time common operating picture across a battlefield or training environment, officials said. The TCE is an interwoven network of mobile and desktop-based devices, which receive information from several real-time Army data feeds to help create a collaborative experience for commanders and their staff, said Cyndi Carpenter, with the Mission Command Capabilities Division at CERDEC. Devices within TCE can operate in disconnected, interrupted, and low-bandwidth environments and communicate through the Soldier Radio Waveform, Ethernet, Wi-Fi, and 4G LTE networks, officials said. Currently, observers, coaches, and trainers, or OC/Ts, at the National Training Center in Fort Irwin, Calif., have been using the TCE to provide an exercise-control common operating picture during training rotations. 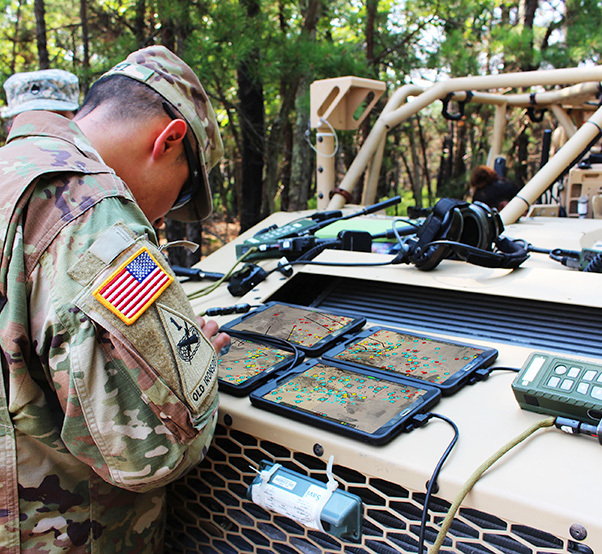 TCE-enabled tablets provide a wide array of features to help Soldiers collaborate and increase situational awareness, said Sgt. 1st Class Sheena Ferrell, who is assigned to OC/T Cobra 3A at the NTC. For example, Ferrell said the system identifies units by military map symbols, which can be user-entered or tracked through TCE or blue force monitoring devices. The library of map nomenclature built into the system can also be used to map the location of enemy units. Likewise, the TCE also has a free-draw feature, allowing OC/Ts to input obstacles, boundaries, troop movements, and other information. TCE-enabled devices can share screens in a collaboration mode or with other individual devices, and also provide trainers with chat, photo, and file sharing features, Ferrell said. In an effort to improve TCE’s accessibility to make it easier for Soldiers to use in any environment, CERDEC has been developing the Single Multimodal Android Service for Human Computer Interaction tool, or HCI SMASH. By incorporating automatic speech recognition software that interacts with the TCE, HCI SMASH allows Soldiers to navigate or input information into the system using only their voice, said Dan Lenhardt, lead HCI SMASH engineer. The HCI SMASH software is fully integrated into TCE-enabled devices, which is a core difference when you compare SMASH to other commercial capabilities, Lenhardt said. By incorporating SMASH, it eliminates the need for the software to reach back to a server, similar to what an Amazon or Google device might do. The Unified Voice Management System is a prototype equipment package that was designed to provide an interoperable solution for radio, digital telephones, and other computer-based or voice software applications. Rounding out CERDEC’s technology improvements for command posts is an integrated software and hardware power system application with built-in intelligence that is capable of prioritizing power resources according to mission needs, officials said. “The challenge we have today is, how do we enable the Soldier to move at the speed of battle with their current power solution, [and] how do they maintain it wherever they are, regardless of their expertise?” said Michael Gonzalez, the CERDEC lead for energy informed operations. The EIO program incorporates a tactical microgrid system that allows personnel to monitor and manage their power systems interactively. The microgrid’s internal software and algorithms are built into the system to control the different power and distribution sources, while the user interface provides Soldiers with situational awareness, Gonzales said. Overall, the smart system is said to reduce the number of generators, fuel usage, and overloads. Eventually, the goal of EIO is to make the power network more “plug and play,” Gonzales said. 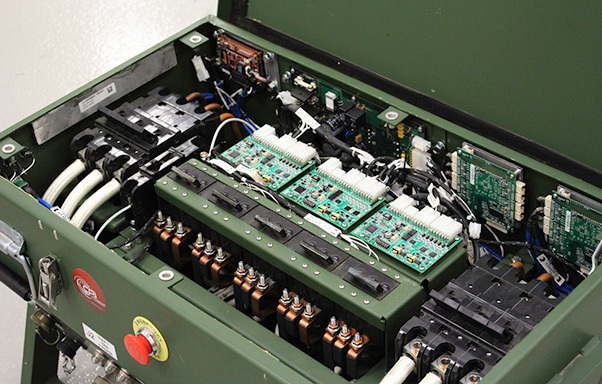 In turn, EIO is looking into new ways to integrate nontraditional power sources seamlessly — like commercial generators or vehicles — to provide Soldiers with efficient and reliable power.